We’ve all experienced them before and interestingly enough, when I did some research, women are more prone to them….. Earworms! You know when a song gets stuck in your head and no matter what you do, it plays over and over again. We’ll I’m currently in the middle of a classic (well it was a classic about 20 years ago) earworm. When my kids were young, we never went anywhere without a stack of tapes or later on CDs. 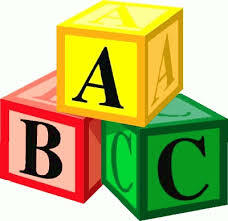 My kids loved Barney and Sesame Street, but their favourite was Sharon, Lois and Bram. So the other day, out of the blue I started humming the Alphabet Song, You know the one that starts, “A ~ you’re adorable, B you’re so beautiful……”. And here I am almost a week later and it’s still rambling around, never far from my lips. So as I started to reflect on what to write this month, I took my “earworm” as a sign that I should use the alphabet for my platform. So, here goes…. A ~ This month, I attend the AGM for Teacher Mentors Abroad, an organization that I’ve been involved with for the past year and a half. Each year teams of educators from Ontario travel to the Dominican Republic to work with Dominican teachers and share strategies for collaborative learning environments. I had the opportunity to share reflections from our Santa Domingo team. It was great to have our Director, Laura Elliott in the audience. She has been a supporter of TMA for many years. I’m so proud of the work of this organization and I feel blessed to be a part of it. B ~ Bulletin Boards, Baskets and Bosses Day ~ as a follow up to our LitCon16 ~ Igniting a Passion for Reading Conference, Jane Baird, one of our Literacy Learning Coordinators has taken the lead and created a number of exceptional bulletin board displays which highlight the conference and our Director’s Hot Reads selections. 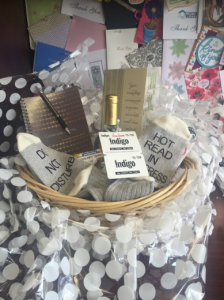 The team surprised me with a wonderful basket of goodies for Bosses Day including personalized socks for Hot Reads and a personalized “Come Write with Me” notebook and pen. E ~Evaluation. This month I’ve had several opportunities to engage in concentrated discussions about evaluation and the importance of reporting, as we’re rewriting our Board’s Evaluation and Reporting policy. Great learning about negotiation and bringing differing opinions to a common understanding has been challenging and yet rewarding. 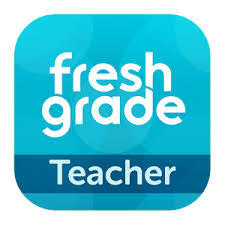 F~ FreshGrade. Our pilot project is certainly testing our “Pioneering” spirit. I’m so thankful for our patient teachers as our IT department and the FreshGrade IT department work together to finalize uploads/downloads and inbetween loads. Fingers crossed that teachers will be ready to use their apps this week. G~ George Couros. Our Planning team invited George to spend a day with our Thames Valley Administrators. He did a wonderful job of inspiring the audience to explore social media and to expand our repertoire of technology practices as we model for our staff and students. H~ Hot Reads. One can’t listen to Steven Layne and not be inspired to celebrate and display what you are reading, as a strategy to turn kids onto reading. As a result of LitCon16, not only are staff at the Ed Center displaying their Hot Reads, but schools throughout the Valley are getting into the spirit. I~ iCon. As the month wrapped up, once again the Learning Technologies team hosted a Technology Conference ~iCon, iDiscover. Over 500 educators came together on Saturday to learn with and from each other. We hosted a session for 50 administrators ~ trying our hand at an EdCamp model. Throughout the morning we were engaged in learning about Google Forms, Google Docs, Google Classroom, Twitter, Padlet, Bitmoji, Remind, Plickers and Google Slides. I have great colleagues! J ~ Journeys. Although it’s been a couple of years since the Literacy team offered Journeys into Literacy as a professional learning series, this past week I was reminded about the power of the professional learning model that we first implemented at Journeys and how it has now morphed into various other portfolios and learning opportunities. K~ Katina Pollock. This month we were invited to share the story of GENTLE at the Western Values and Leadership Conference. At the end of the presentation, Dr.Katina Pollock, the Director, Western’s Centre for Education Leadership and Co-Director, Knowledge Network for Applied Education Research (KNAER) came over to chat and she reminded me of the first time we met, as she was collecting data for her principal workload study and I was the principal at Wilfrid Jury. She recalled my telling her about Twitter and the power of social media. At the time she wasn’t on Twitter. She was excited to share that now, Twitter is a natural extension of her work. L ~ Languages Team, LitCon16 and Layne. 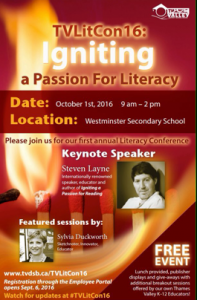 The month started with our first, but definitely not last, Literacy Conference. The team did an outstanding job, from finish to end of creating an event that continues (a month later) to impact the work of teachers in classes. Steven Layne’s message will continue to have us cheer on others from the balcony. M ~ Math ~ With both our board the province deeply embedded in a Renewed Math Strategy, the work of the Literacy team has become more important as we continue to model and remind others that our students need quality instruction, resources and support in both Literacy and math. N~ This month my audiobook was The Nest, written by Cynthia D’Aprix Sweeney. A cleverly written account of the lives of 4 siblings as they come to terms with an inheritance which was once a given until a tragedy changes the trajectory of their receiving of the money. O ~ Our Voices, Our Stories is a compilation of both newcomer student and parent voices, sharing their journey and transition to Canada. The video is being released this fall and Jennifer Shields, our ESL TOSA had an opportunity to share components of it with some administrators at our OPC Symposium. Heartwarming and poignant! P ~ Plickers ~ This past month I had a couple of opportunities to share the power of collective “live” data through the use of cardboard symbols and a mobile app. I’m excited to see other portfolios/administrators use them in a meaningful way with their teams. Q ~ QIS. For any Scrabble players, you’ll know this word and have probably used it on many occasions. One of my favourite “down time” activities is to play Words with Friends online. My mom and I always have at least one and sometimes up to 5 games going at once. She has learned to use the chat feature as a means of “texting”. My other regular opponent is a teacher from Fox, who just announced his retirement this week. I wish him all the best. May mean more time for Words with Friends…. 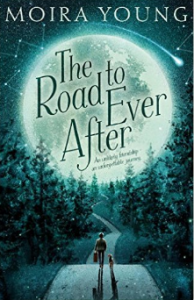 R~ The Road to Ever After by Moira Young. As the month of October comes to a clos e, I decided to treat myself to some new books from Indigo. Love that store! One of next projects will be to share new releases with the system. The Road to Ever After looks like a great read for ages 9-12. I’ll let you know, once I finish it! S~ Sarah Conrad and Summers’ Corners. Each year, Carol Mailing, the surviving member of the Conrad family generously donates funds to support literacy in Elgin County. This month we were thrilled that she was able to visit Summers’ Corners and see firsthand the impact of her funding. The students in Simon Golding’s LEARN class presented Carol with a powerful slide show and thanked her for the funding which made it possible for them to purchase iPads, computers, document camera, data projector and a significant amount of literacy materials and math tools. They also took the opportunity to share their All About Me presentations. One student, Fatimah (a recent addition to the class, from Syria) shared (with the help of another student) that she is most proud of her parents, because they were brave enough to come to Canada. Well, there wasn’t a dry eye at that point. I love my job! T ~ Twitter. This month our OPC Twitter account took off. As the Social Media Director for OPC, my goal is to get all of our administrators embracing the power of using social media to leverage their leadership skills. I’m so proud of my colleagues for sharing the exciting work that is happening in their schools and remembering to use #tvdsbopc. U ~ Underwater. In a reply to an email from a colleague that I started my career teaching alongside of, I was reminded about a unit that we developed in our first year as teachers, while taking our Primary additional qualifications. 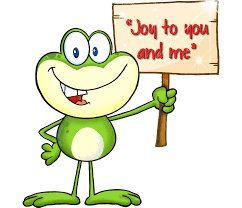 Our Underwater theme was complete with not only amazing activities and texts, but a theme song, Three Dog Night’s Jeremiah was a Bullfrog. V~ Volume Purchase Pricing. For those of you who manage a set of iPads, you’ll know the term VPP. For me, this past month required a bit of learning curve as we transitioned our 60 ESL teacher iPads, our 33 Instructional Coach iPads and our 15 Language iPads to this management system. Gotta love technology! W~ WS Fox. “Once a Flyer, always a Flyer” was a text that I received after I visited the school where I started my admin career. The current amazing admin team were kind enough to invite me to join them on their PD Day this past Friday. I loved reconnecting with so many outstanding educators. Walking the halls still felt like “home”. The Fox tradition lives on! X ~ eXcited, eXhausted, eXhilarated….. As I come to the end of the alphabet and my reflections from October, those three words seem to sum it up! Y ~ Yvonne Lennards, was one of my hosts on Friday as we reviewed her caseload of English Language Learners at WS Fox. As we went through her caseload, other teachers popped in to pick up Hallowe’en costumes, discuss transition gifts for new students and share strategies for ensuring their United Way donations would be significant. That conversation reminded me that our teachers do so much more than just “teach”. Z ~ Dr. Zed to be exact! This past week, Catherine Zeisner, not only graduated with her doctoral degree, but she invited 20 Thames Valley administrators to come and spend an hour with her pre-service teachers. We each had the absolute pleasure of spending an hour with these young, excited, somewhat nervous, but very prepared teacher candidates to discuss classroom management and the importance of creating a safe, positive learning environment. I love my job! Well it worked, my earworm has been “tamed”! I’ve transitioned from the Alphabet to Bullfrogs. If you were to capture your past month, what would your top 26 reflections be?